After living with it for 8 months, it’s now time to part ways with the TVS Apache RTR 160 4V. Sure that’s been a long time with a bike that has an equally long name but, hey, we aren’t complaining, for this motorcycle is an absolutely enjoyable machine. During its stay in our long term garage, the RTR 160 4V changed hands, mainly between Jared and myself. Both of us would primarily use the motorcycle for our daily commute. The thing that impressed us right from the start was this motorcycle’s refinement. It was even more surprising for me because I’ve owned previous gen Apaches, which had a lot of engine vibrations. And I can’t stress on this more, but TVS engineers have aced it in the new model. The powertrain is buttery smooth and not a single panel resonates or rattles. Another area where the RTR has improved is in the ergonomics department. The RTR 160 4V doesn’t have a ‘racy’ stance with forward-set foot pegs, meaning it’s more accommodating and supremely comfortable. The suspension setup is also in line with the comfort theme, as it is no longer rock solid as it used to be. It's firm enough to let you keep it pinned around a corner, but, at the same time, it doesn’t feel stiff while going over patchy roads. Something that the old RTRs could never actually do. Now, because the new bike is so refined and comfortable, I was initially fooled into believing that the RTR has lost its edge. And to some extent, that’s true, but the bike’s performance and handling are still its key highlights. It has those quintessential TVS genes. Only that it has matured into a do-it-all motorcycle so as to cater to a larger audience, and not just boy racers. Having said that, I do wish the front brake had enough bite. Under panic braking, there’s a lot of guesswork involved, and that’s not a good thing. In terms of reliability, the bike fared well for the most part, but a bad oil seal last month resulted in some leakage from the oil pan. It was quickly fixed by TVS' technicians. A special mention to TVS’ aftersales as well, as they were quite efficient and prompt during periodic services. I think apart from having a good product, that’s also what makes or breaks a brand. 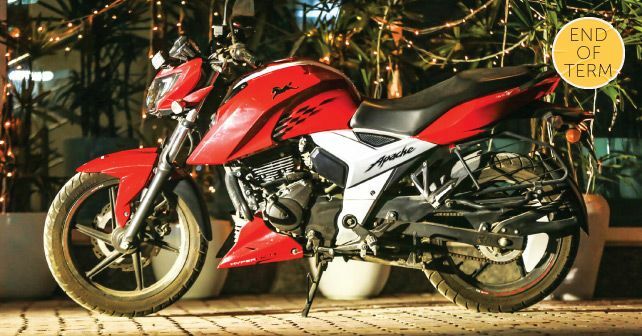 So, overall, it was a very positive experience with the Apache RTR 160 4V.